A member of Afghanistan's special forces points his gun as he observes the enemy lines in Achin district of Nangarhar province in eastern Afghanistan, April 23, 2017. In a remote district of eastern Afghanistan's Tora Bora mountains, where Osama bin Laden once took refuge, hundreds of local villagers freed from Islamic State control have been enlisted as a militia force to fight the terror group, provincial authorities said. Afghan Special Forces patrol at the site of a MOAB, or ''mother of all bombs'', which struck the Achin district of the eastern province of Nangarhar, Afghanistan April 23, 2017. 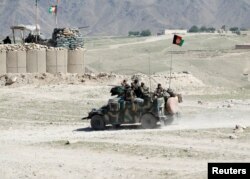 The ongoing Taliban insurgency in Afghanistan has stretched the security forces thin on several front lines across the country, pushing locals in Tora Bora to take matters into their own hands and defend their region in the absence of an Afghan military presence. 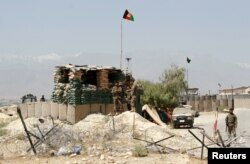 Parts of the area also have been in the Taliban's control from time to time in recent years. The Afghan National Army keeps watch at a check post in Chaparhar district of Nangarhar province, Afghanistan, May 24, 2017. 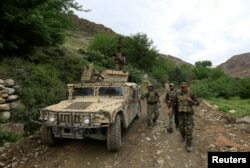 U.S. and Afghan forces continue anti-IS ground and air operations in Nangarhar's Haskamena and Achin districts, and reportedly have cleared several remote and mountainous areas of IS fighters. The forces have reached areas that had been under the control of anti-government groups for years. Afghan special forces patrol in Pandola village near the site of a U.S. bombing in the Achin district of Nangarhar province in eastern Afghanistan April 14, 2017. VOA's Zabihullah Ghazi contributed to this report from Nangarhar.